HONOLULU, Hawaii, June 2, 2010 (ENS) – Hawaii Governor Linda Lingle today issued an executive order to establish surfing reserves at two of Hawaii’s most important and well-known surfing areas. Both reserves are located in the state waters of the island of Oahu. The governor’s order establishes the Duke Kahanamoku Surfing Reserve, which includes surf breaks along Waikiki Beach bounded on the west by the Ala Wai Canal and on the east by the Waikiki War Memorial Natatorium. The order also establishes the North Shore Surfing Reserve, which includes surf breaks from Ali’i Beach in Haleiwa to Sunset Beach. 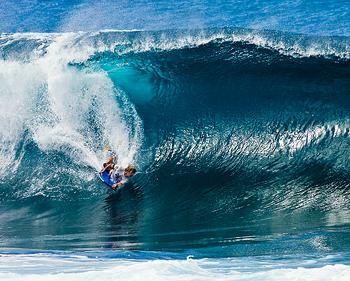 Surfers and spectators from all over the world come here every winter to experience the 25-foot spectacular waves at spots like the Banzai Pipeline, Sunset Beach and Waimea Bay. Senator Hemmings’ bill was approved unanimously by the State Senate, but was killed by the House on April 29 in the final hours of the last day of the session. Governor Lingle’s executive order resurrected the measure. Political observers say they cannot recall a Hawaii governor ever issuing an executive order to restore a bill rejected by legislators. Senator Hemmings’ idea to establish surfing reserves in Hawaii was patterned after the National Surfing Reserves Australia program, which currently recognizes about a dozen iconic surfing sites throughout Australia because of their intrinsic environmental, heritage, sporting and cultural value. “It’s like declaring Diamond Head a national monument,” he said. The executive order does not provide any funding for the surfing reserves, but enables the Department of Land and Natural Resources, which is statutorily responsible for managing all waters and coastal areas of the state, to receive donations that could be used for signs or markers that identify the surf reserves. Under the executive order, the Department of Land and Natural Resources may assist in promoting federal, state and county collaboration in identifying, nourishing and protecting the Hawaii surfing reserves.